Paper mills are a longstanding Wisconsin industry, and can be found around the state, including on the Fox River in Green Bay. WisContext: Which Wisconsin Exports Are Canada's Tariffs Hitting The Hardest? 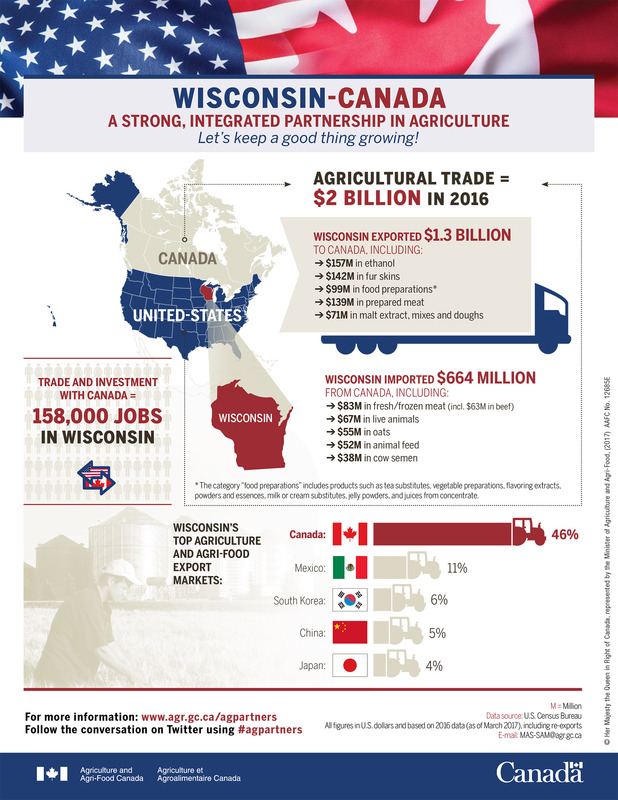 Indeed, Canada is the United States' largest trading partner, and the biggest destination by far for exported goods from Wisconsin. Between 2008 and 2017, the state's exports to Canada have averaged about $6.85 billion per year, while imports from the U.S.'s northern neighbor have averaged around $4.1 billion annually. But as the Trump administration ignites trade wars around the globe, Canada is fanning the flames, and has clearly done its homework on Wisconsin. 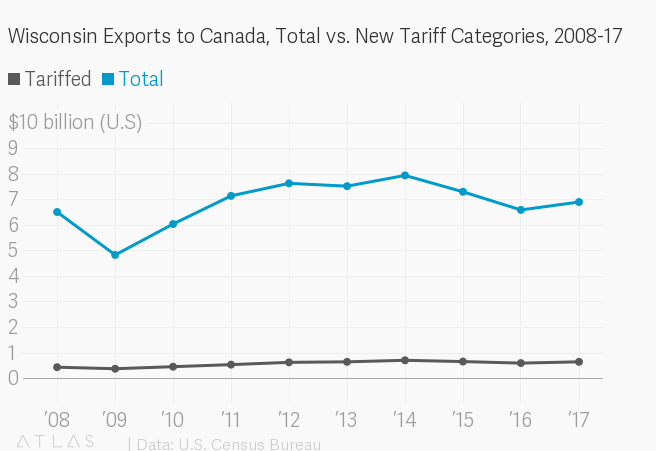 After the U.S. announced new tariffs on Canadian steel and aluminum products in May 2018, Canada imposed retaliatory tariffs on dozens of American goods. Using categories from the World Customs Organization's Harmonized Commodity Description and Coding System — which attempts to give nations and businesses across a global marketplace a common nomenclature for thousands of types of products — Canada not only targeted U.S. steel and aluminum, but also a host of agricultural, food, paper and chemical goods. Canada's tariffs, which went into effect on July 1, apply to 228 categories of American products. Of those, 163 cover those that Wisconsin has exported to Canada over the past decade. It's a surgical strike, not just at Wisconsin but likewise at other states that Donald Trump won in the 2016 presidential election. Canada has hit products Wisconsin makes very little of (such as sleeping bags) and yet more industries that make up a significant chunk of the state's export footprint, like the chemical industry. The tariffs include a range of household products, from refrigerators to mattresses to washing machines, along with everyday odds and ends like pens and candles, as well as on the less-everyday end of things. For example, the trade war with Canada will also strike at Wisconsin's boatmakers, who depend heavily on international markets.